A quality, affordable hardshell case that fits most Strats, Teles, and similarly shaped guitars. This Musician's Gear Deluxe Electric Case was built to be road-tough so you can protect your favorite axe when you're on the go. Constructed of 5-ply cross-laminate wood, it has a plush interior lining to keep your baby's finish safe and sound. It also has heavy-duty hardware to protect the case from accidental dings while three locking fasteners keep your guitar from any accidental opening while you're en route to your gig or practice. This Deluxe case also has an interior accessory compartment that supports the guitar's neck while having enough space to hold your cables, a pedal or two, picks, strings, and more. 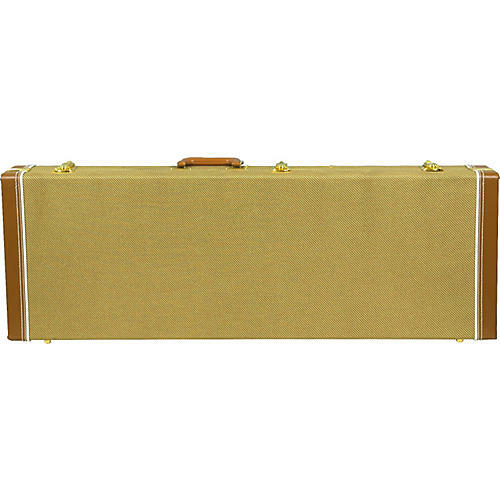 The Musician's Gear Deluxe Electric Case fits most Stratocasters, Telecasters, and similarly shaped guitars. Choose tweed or black (note: different sizes pers your seclection - see specs for dimensions). Fits most Strats, Teles, and similarly shaped guitars.